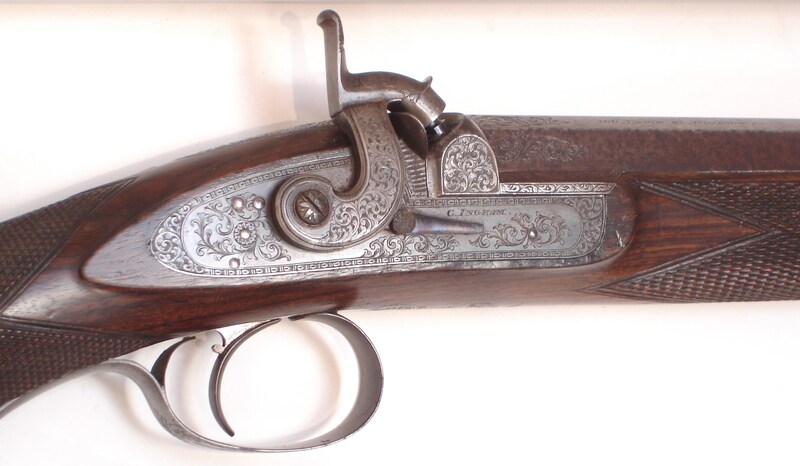 A superb percussion .451" sporting or match prize rifle by Charles Ingram, Glasgow. Very high quality and unusual in that the barrel is mounted so that the angle of the octagon lies along the sighting line. I believe this is a feature unique to Ingram rifles. This rifle was a prize in a rifle match on 10th September 1861 shot for by the 1st Lanarkshire Rifle Volunteers and won by James Anderson. A superb percussion .451″ sporting or match prize rifle by Charles Ingram, Glasgow. Very high quality and unusual in that the barrel is mounted so that the angle of the octagon lies along the sighting line. I believe this is a feature unique to Ingram rifles. This rifle was a prize in a rifle match on 10th September 1861 shot for by the 1st Lanarkshire Rifle Volunteers and won by James Anderson. The silver escutcheon also carries his initials. It is complete with it’s original canvas case which also bears the initials “JA”. The rifle is fitted with windage adjustable target sights and is covered in superb engraving. Barrel is 32″. Fine condition with most of it’s original finish. Well figured stock and sharp untouched checkering. Mint bore. The case has been amateurishly relined inside with new baize and really should be redone properly. Otherwise a superb example of the best of Scottish gunmaking. The photos just don’t do this rifle justice. My name is Andrew Iosson and I am the Managing Director of Fine Sporting Collectables Ltd. I exhibit at all the major antique arms fairs in the UK, including London (Earls Court), Birmingham, Bristol, Bisley and Hertsmere and travel all over the UK to source new pieces and meet with fellow collectors and dealers to trade items. I am keen to buy and offer sleepy items with little or no restoration and tend not to clean up stock for sale so that the purchaser has the pleasure of cleaning to the particular point at which they are happy with the appearance of the item. I have found this point is a fairly personal thing and varies considerably between collectors. I am very keen to buy good pieces – either guns or accessories and I am very happy to take items in part exchange or swap.